When it comes to traveling with your family, Indiana has an abundance of options that both Mom and Dad and the children will enjoy. 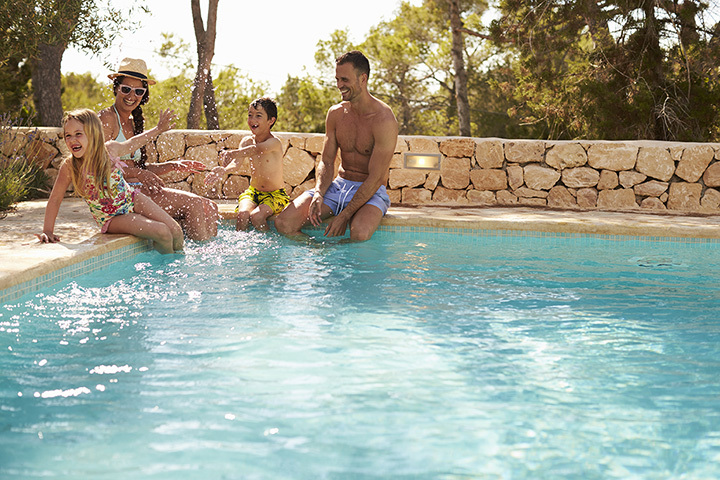 From thrilling water parks to charming campground resorts, get ready for the ultimate in family-friendly retreats. Here are the best resorts for families in the state. Big Splash Adventure is the place to be year-round for all your water park fun! Zip down the Jolly Roger Jetty water slide, or plunge your way down through Pirate’s Plunder and into the park’s famous “toilet bowl,” or simply relax on the Lost River. The park is over 40,000 square-feet and there is something for everyone here. The park also features the Treasure Chest Arcade and Galley Grill, and other attractions including Shotz Lazer Tag and Mini Golf and Wilstem, where visitors can enjoy ATV and zip line tours, horseback riding, or enjoy an Elephant Encounter! Big Splash Adventure is more than just a water park. It’s an adventure! Clear Lake Resort is located on the northeastern shores of Clear Lake, Indiana. The area is over 800 acres and the water is crystal clear. Families can enjoy the one-and-a-half-mile sunset view from one of the resort’s two 140 foot piers, or go for a swim at the resort’s natural swimming area. The resort was founded in 1953, and has been the place for families to go for a relaxing waterfront vacation. The resort also features water and land volleyball, and each rental unit has a fully equipped kitchen, heating and air conditioning, a patio with a picnic table. It’s the perfect family getaway! A great attraction in southern Santa Claus, Indiana, is the Lake Rudolph Campground and RV Resort. Featuring exciting on-site activities like mini golf, a 3,700-square-foot swimming pool, fishing lake, and Santa’s SplashDown Water Park, there is so much to see and do here at Lake Rudolph! Santa’s SplashDown features two large, fiberglass water slides, and for the little ones, there is Dasher Splasher Splash Pad. The resort also features the Blitzen Bay Family Pool and Baby Blitzen Kiddie Pool, two playgrounds, two basketball courts, a fishing lake, beach volleyball, game rooms, nature trails, and plenty of water rentals! Indiana Beach, as it’s affectionately referred to by many Hoosiers, has been a favorite family destination since it first opened in 1926. The park has over a dozen rides to choose to choose from, including its newest ride, Zero G, Hoosier Hurricane, Double Shot, and Indiana’s first custom steel roller coaster, the Steel Hawg. Join your kids on Cap’n Crow’s Bumper Boats or the Big Flush, Indiana Beach’s refreshing and unique water coaster. For the little ones, let them enjoy the Frog Hopper or the Dragon Wagon. The resort also features a large swimming area with a sandy beach. It’s the perfect family getaway for all ages! Swan Lake Resort isn’t your typical resort. It’s a relaxed, laid back environment set on over 500 acres of beautiful Indiana countryside. It’s where great golf and Midwest hospitality come together. The resort features a modern clubhouse with fully stocked golf shop, a sports style bar and grill, and a 36-hole golf course. There is something for everyone here at Swan Lake, including a gorgeous pool and a state of the art Golf Academy! The Oakwood Resort in Syracuse, Indiana, is a spacious, 77-room and luxury suite waterfront hotel that features a beach, tour boats, a restaurant and bar, and a great game room for the kids. The game room includes everything from Pac-Man to air hockey! Outdoor activities for the whole family include a walking path, bicycles and local bike paths, paddleboards, kayak rentals, basketball courts, Frisbee and Corn hole, as well as a giant jenga course! Can you Jenga?